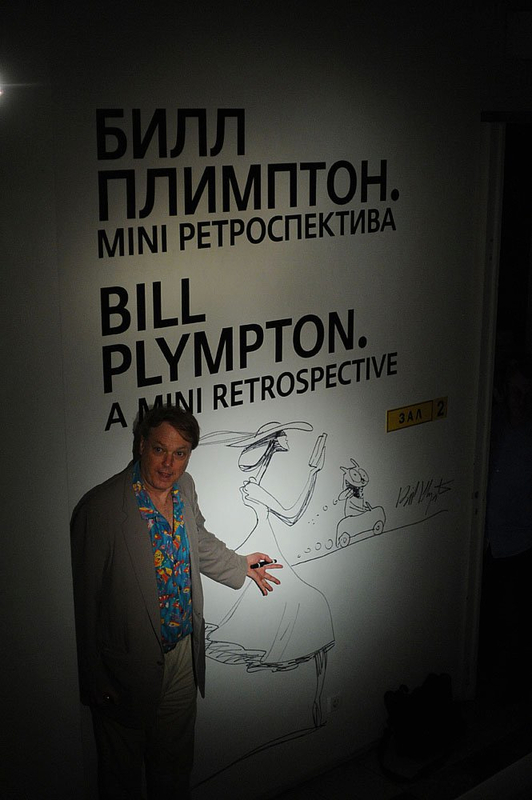 In November of last year, I was invited to Moscow by Lida and Misha to present an exhibition of my cartoons at the Solyanka Gallery. 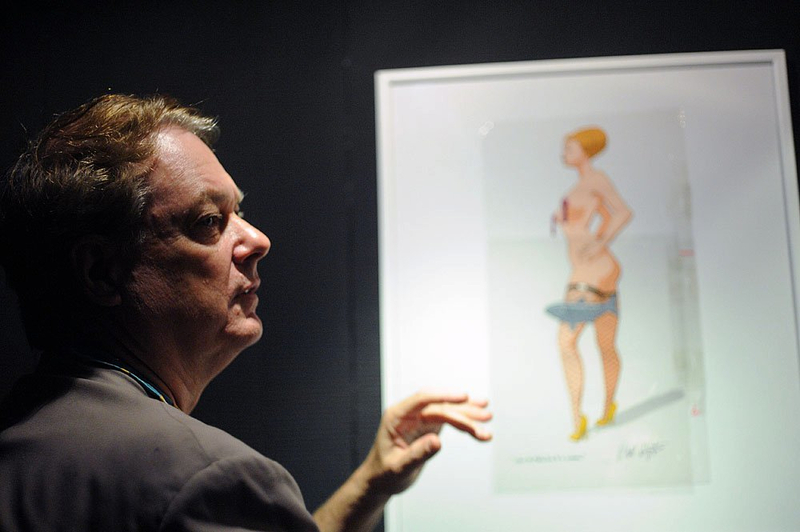 They relegated me to the basement and, after doing numerous interviews and publicity, discovered there was a huge audience in Russia for my art. So, in time, I was invited back, but this time I took over the entire gallery! It was a major exhibition. I traveled to Moscow at the end of June to partake in the opening. This time, however, the gallery was run by a man names Fyodor, not Lida and Misha. The first sign of trouble was when Fyodor forbade me from selling my DVD's and books on opening night, when the crowd was very Plympton-friendly. I must say the exhibition was wonderful – my art and animation was wonderfully presented and the fans were extremely enthusiastic. However, Fyodor limited me to selling my merchandise only at my masterclass (2 days later), and dictated that they must be sold for double the price (because the gallery wants their cut). "But at 1,000 Rubles no one is going to buy my stuff," I complained. Fyodor replied, "No problem, that's a good price. You'll sell a lot of DVD's." So the night of the masterclass comes, and Fyodor insists he share the stage with me, and engage in intellectual conversation, sitting in 2 chairs. He didn't consult me about the format of my masterclass, he just assumed I would follow his direction. 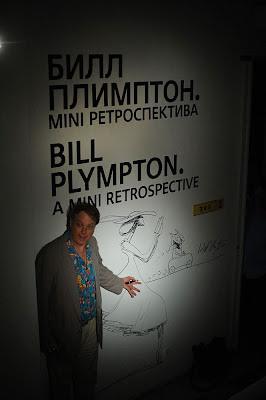 Excuse me, but I think that the packed audience who showed up for the evening came to see Bill Plympton, not Fyodor. So, I took the bull by the horns (or more appropriately, the microphone) and began to talk, standing up and doing my show like I have done countless times before with Pixar, Disney, and Dreamworks. He protested, but there was nothing he could do about it. Then, halfway through my show, he whispers to me that I have to wrap up in 5 minutes. I still had 3 more films to show! He claimed that he wanted 30 minutes for Q&A, where he can take the center stage to direct the questions. I freaked out. What about the other films I wanted to show? I had to speed through the program, robbing the audience of some of my best stuff. So who is in control of my masterclass? Consequently, I cut the Q&A short to get to the sketches and selling of DVD's (which is how I'm able to survive as an independent). Wouldn't you guess it – the 1,000 Ruble price was way too high for the audience. I only sold 2 DVD's! What a disaster. I realize that this blog will offend a few people, and I'm burning some international bridges here, but this guy Fyodor has serious ego problems and he ruined my grand exhibition in Moscow. One of the very cool aspects of the exhibition was that it was sponsored by MINI (Mini Cooper), a division of BMW. They were wonderful. The gave me a car and driver for my stay, plus, outside of the gallery, they had 2 "Mini's" that were covered with artwork from my films. 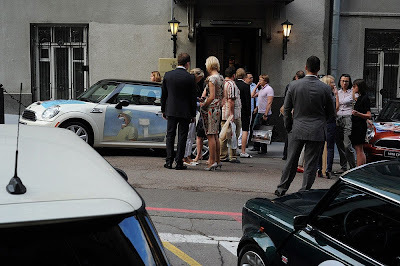 It was so cool to see my drawings – especially the weird ones - on all sides of the beautiful Mini Cooper. I want to publicly thank the people at MINI for their very generous hospitality.